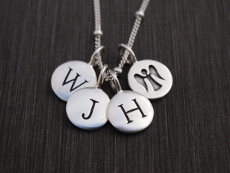 Sterling silver tiny tag initials approximately 8mm are hung from a satellite chain which come in 16" or 18" lengths. The discs come polished or a brushed finished. 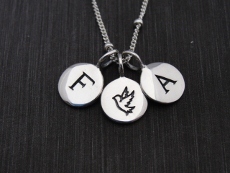 To order this item, please select a style, initial, chain, and finish. Then click Add to Shopping Cart button. HIp Tip: Choose any gold charm to go with tiny tags necklace.